2. Add beef and season with palm sugar and fish sauce. 3. Once the beefs are cooked, then add basil, chilli and kaffir lime leaves. Transfer to a serving bowl. Serve with steamed rice is also a good way to enjoy this recipe. 1. Pour the coconut milk into a pan and bring to a boil. Add the chicken, cook until is done. 2. Add the shallot, galangal, lemon grass, chili, lime leaves, salt and mushrooms, then bring it to boil for 5 minutes. 3. Remove from the heat and stir in the lime juice, fish sauce and coriander leaves. 1. 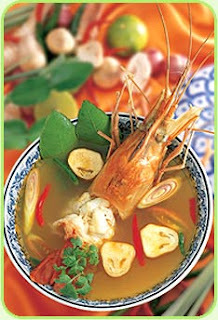 Boil the stock in a pot, add the lemon grass and lime leaf, then the prawns and mushrooms. 2. When the prawns are cooked, about 8-10 minutes, remove the pot from the heat and add the rest of the ingredients. 3. Adding more fish sauce or lime juice, the soup should be spicy-sour and a little salty. Fish sauce 1 - 2 tbsp. Coconut sugar 1 - 2 tsp. Unsalted, toasted peanuts, chopped 2 tbsp. Thai chili flakes (prik pon) 1 tsp. White vinegar or tamarind pulp juice 1 - 2 tbsp. Fresh red spur chili peppers, julienne 1 tbsp. Spring onion, julienne 1 tbsp. 1. For best results, this dish should be cooked in a wok, Prepare all your ingredients in advance and have them ready beside you. Heat up the oil in a wok until almost smoking. 2. Add the chopped garlic and pressed beancurd to the wok. Stir-fry until cooked but not browned; add the prawns and stir quickly. 3. Prawns cook very fast so do not over cook them. Once the prawns are slightly white add the flat thin rice noodle from Chanburi province. This noodle has to be soaked in water to make it pliable but not soggy, and drained before use. 4. While stir-frying the noodles, season this dish with fish sauce, coconut sugar, chili flakes and vinegar. The liquid from the prawns and seasoning sauces will make the noodle soft yet " al dente" . Add peanuts and toss to mix well. 5. Finally add the bean sprouts and quickly toss in the hot wok to warm them up but do not over cook them. Garnish the dish on top with a julienne thin omelet, red spur chili peppers and julienne spring onions with a few fresh bean sprouts and a lime wedge on the side. 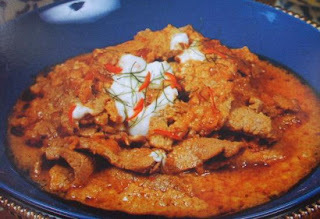 This dish is very famous in Thailand and the world over. It's a great lunch item and our national pasta dish. Chanburi noodles are easily found in most Asian grocery stores, they come dry packed in a bundle wrapped in plastic. 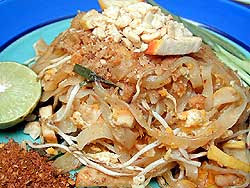 Ask your Thai or Asian grocer for phat thai noodles. 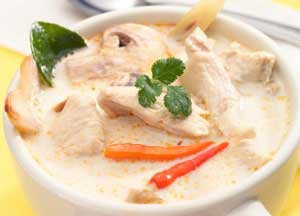 Eating and seasoning tips: Westerners usually season their pasta dishes with salt, pepper and parmesan cheese but each phat thai dish is seasoned by the diner with fish sauce for saltiness, sugar for sweetness, lime juice for sourness, chili flakes for spiciness and peanuts for crunchiness.